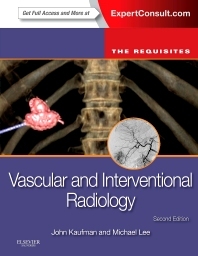 Get the essential tools you need to make an accurate diagnosis with Vascular and Interventional Radiology: The Requisites! This bestselling volume delivers the conceptual, factual, and interpretive information you need for effective clinical practice in vascular and interventional radiology, as well certification and recertification review. Master core knowledge the easy and affordable way with clear, concise text enhanced by at-a-glance illustrations, boxes, and tables  all completely rewritten to bring you up to date with todays state of the art in vascular and interventional radiology. Understand the basics with a comprehensive yet manageable review of the principles and practice of vascular and interventional radiology. Whether you’re a resident preparing for exams or a practitioner needing a quick-consult source of information, Vascular and Interventional Radiology is your guide to the field.